How would Jesus vote? For my candidate of course. So there. Now that we all know that the Divine One supports my way of thinking, you all better get in line, or else. Seriously though, how would Jesus vote in 2016 America? That’s a fun game isn’t it? I usually see this type of post as we approach elections — this year is no different. I have read theologians make arguments as to why their preferred candidate is the morally superior choice. I hear arguments that state that Jesus would vote for the Democrat because that party has supposedly cared for the poor through their policies and Jesus had a special place in his heart for the poor. He preached about people doing things for the poor. Democrats are typically opposed to the death penalty — Jesus would be too. Yes, Jesus would be a good liberal Democrat. Then I hear arguments that state that Jesus would vote for the Republican because that party is opposed to abortion and Jesus would be against abortion because abortion is killing an innocent person. Republicans are for “family values” — however you want to define that murky term. Clearly Jesus would be for love of family over government any day right? Yes, Jesus would be a good conservative Republican. Oy vey! Enough already. Stop trying to make Jesus something that he never was — An American in the 21st century. He was a Middle Eastern poor guy (and yes, still the Son of God) that never had the opportunity to vote and wouldn’t have understood the concept. His entire life was lived in a region that was under occupation by a ruthless empire. No one in that region had a concept of rights as we understand them, had a say in who was to rule over them, or had any legal way to express their opinions directly about the rulers of the times (unless they didn’t mind being killed for expressing their displeasure). So can we stop kidding ourselves into believing that Jesus would vote for either a Democrat or Republican. If anything, Jesus would look at government with suspicion. Government in Jesus’ time was oppressive — pay your taxes or else suffer the consequences. Stay out-of-the-way of the soldiers or suffer the consequences. Careful what you say about those in charge or suffer the consequences. Remember Jesus was crucified by the Roman empire as a threat to their stability — a political execution. There was no welfare state for the masses — government was not about serving their needs. Government existed for the benefit of the emperor. It existed to keep order. It existed as an efficient means of collecting taxes. Jesus spent a great deal of time preaching an alternative government — the Kingdom of God. Whereas the Roman empire and its government was based on worship of the emperor and war and strength, the Kingdom of God was based on the worship of God and peace. The Roman empire and its government was interested in obtaining and keeping power, while the Kingdom of God was interested in empowering the powerless. How would Jesus vote? No one has any idea what so ever. And you are kidding yourself if you think you do. I have a feeling though that Jesus wouldn’t be voting — ever. He’d be more concerned with implementing the Kingdom of God in place of all human governments — including the US government. He’d be more concerned with preaching a message of peace, mercy, forgiveness, and helping the poor — not worrying about what government policies were in place. Because government policies are concerned with one thing — the physical nature of poverty. Jesus would go beyond that, recognizing something government never would — the spiritual poverty that exists. How would Jesus vote? I’m guessing that he wouldn’t. He’d do the same thing he did with parables. He’d be offered two options by someone trying to trap him and he would propose an alternative that was completely different. Choosing between the two options would be endorsing a broken system that he never bought in to. I’m guessing that’s what Jesus would do. And just like the Pharisees who wanted Jesus to endorse their view of the world and were sorely disappointed and then angry at him, I have a feeling there would be a lot of Democrats and Republicans would be just as disappointed and maybe even extremely angry that Jesus not only dismissed their party loyalties, but would want to change the governing structure of the nation completely. I have a feeling he wouldn’t be invited to their party conventions, not even to offer the prayer. What a party pooper! I have to admit – I’m really confused these days. It seems that the whole world is up side down. I lived half my life in politics and thought I understood campaigning and politics – I’ve certainly done enough campaigns to make a legitimate claim to understanding. Yet I find myself speechless when I look at the political world. Nothing seems to make sense this political season. Candidates who wouldn’t have gotten the time of day in the past aren’t just seen as legitimate, but winning. It seems as though what is legitimate now is outrageous language meant to incite fear and anger and division. I’m confused about religion too. Again, you’d think someone who has spent a good portion of his life thinking about, contemplating, praying, studying, etc about theology and God and religion would be able to claim some mantle of understanding about the subject. Yet I find myself dumbfounded when I look at the so-called spokespersons of Christianity in the US. Nothing seems to make sense. I don’t understand so-called Christian leaders speaking words of judgement, exclusion, anger, fear, and nationalism. Where is the hope, joy and grace? The list could go on, but I think you get the point. When I look out at the world, so much doesn’t make sense to me right now. John Pavlovitz wrote an article about this recently. When I read it, two paragraphs spoke to me and express how I feel pretty well. I’ve always thought that caring for the poor and sharing my blessings and walking humbly and showing mercy and seeking peace were all inherent in my calling as a Christian, yet from what I can see I really dropped the ball somewhere along the way, because these are certainly not on trend in the Church I’m seeing on the news and in Christian Universities and out on the campaign trail. I seem to remember the Jesus of the Gospels shunning status and opulence, casting aside power and privilege, bending to serve and feed and heal, but that can’t possibly be right given the headlines. Apparently we Christians are supposed to fear and resent and vilify those who don’t look or talk or believe or love the way we do, we’re supposed to wield the power and be the bullies and seek retaliation and shut down disagreement. From what I can tell based in what I’m seeing, followers of Jesus were commissioned by him to go and be angry, crass, affluent, racist, misogynistic, homophobic warmongers, known in the world by our incendiary rhetoric, our stockpiled arsenals, our doomsday predictions, and our flag-waving bravado. (Funny, I always thought it was by our love, but that shows you the level of deception I’ve fallen victim to). I find myself following a Christian path that seems unpopular, at least in the wider American culture. It’s been said that you have to be out of your mind to follow Jesus. His way is not the way of the world. His way is not the popular and historical way of dealing with the world. The way of the world is empire – conquer and eliminate those that would contest that power. Peace through fear. The leaders of empire speak emotional words meant to rile the masses to do their will. The angry and irrational mob has become symbol of this. There is no possibility of rational discussion with this mob. There is no opportunity for reasonableness. There is no chance to have discussion – where there is listening and speaking. There is no compromise for the angry mob – it’s either their way or the highway. This isn’t new in history. It has happened many times in human history. Apparently, we haven’t learned this lesson yet. Which is all the more reason for me to follow a different path – one that doesn’t make sense to the world (or at least to American culture and even popular cultural Christianity). the path charted by Jesus – the way of peace and love and service. I must be out of my mind. Thank God for that. If the way of the world made sense to me, I’d be concerned about my mental health. 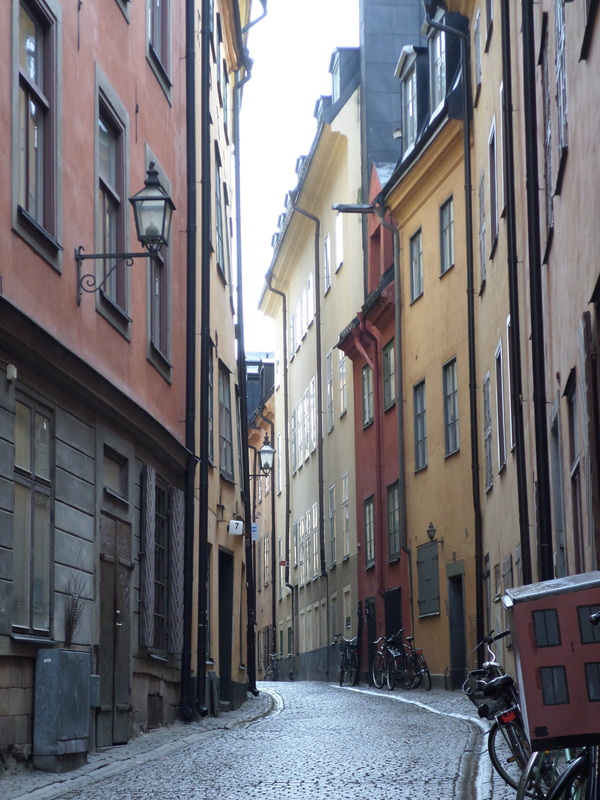 Gamla Stan is a lovely idea – the very center of Stockholm. And by center, I mean the center geographically, politically, in terms of power, and culture. It’s also where all the tourists go. And for good reason too. It’s beautiful. 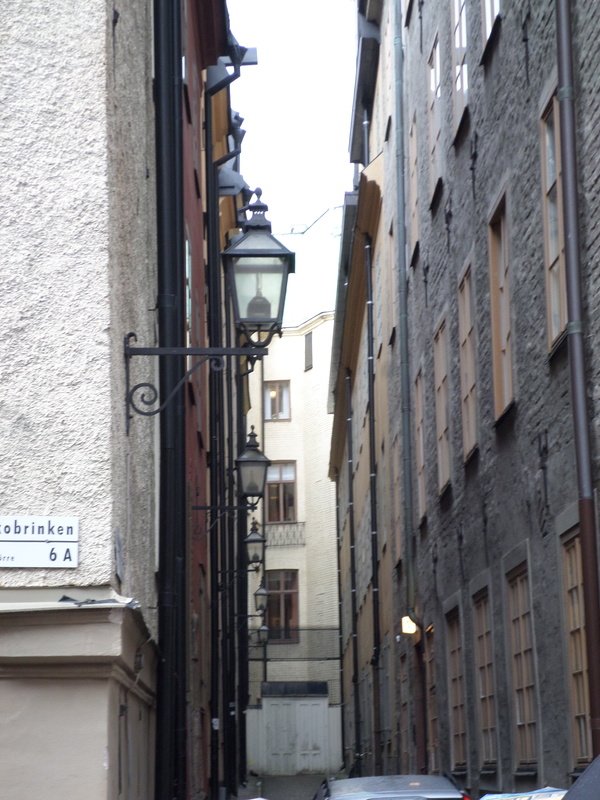 When you walk through Gamla Stan, you feel like you are walking back in time to when Sweden was an empire and a major world power. 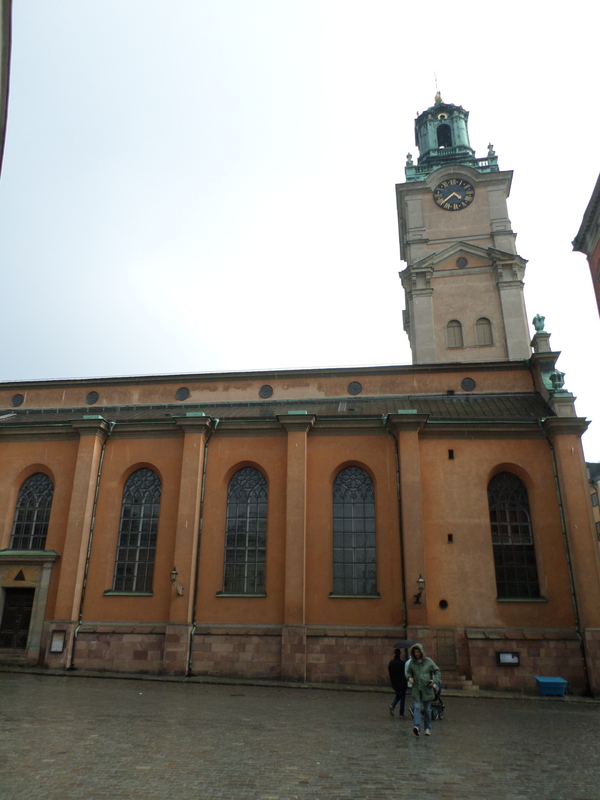 But now, Sweden is like many other nations, just another great place to visit and probably a great place to live. Sweden learned some time ago that it doesn’t pay to have an empire. The power actually weighs in on itself and can be crushing. And so now, Sweden is another country in the family of countries. It’s got its own challenges, but it is also stable and welcoming. 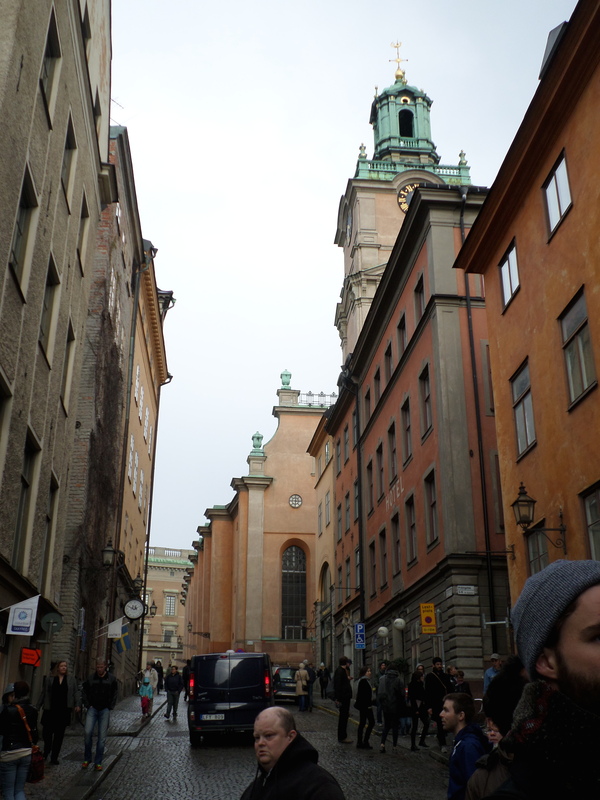 Sweden does what it can to stay out of wars, yet is willing to open its doors to refugees. This morning I was having a serious debate with myself – which video do I want to re-post. I decided that both were too good to pass up. Then I realized, maybe the two actually go together. Yay! So here’s the first video. It’s Brian Zahnd talking about empires versus Jesus. It’s a great message and one I’ve been contemplating for a while now. Less than five minutes and well worth it. I’ll just jump to the second video and then provide a few thoughts. It’s a fake news report that pretty much sums up every financial new report you’ve ever seen. (fair warning – they drop the F-bomb in the video). It’s pure brilliance and well done and less than three minutes. There’s a million things racing through my mind regarding these videos. Yet, I’ll cut to the chase. These videos are excellent because they speak a truth in a powerful way. How often are we wrapping ourselves in the flag and propping up the empire at the expense of what we claim to believe is our foundation? How often are we looking for an emotion to feel alive – even if that emotion is painful, rather than use that emotion to be called out into the world as Jesus calls us. In both cases, the empire and the “news” want us to be sheep that are herded here and there, too busy and too tired to do anything. And we are supposed to be sheep, it’s not far off. However, as Christians, our shepherd is different and leads us in a different direction – one that calls us to act out of love, because we are loved. One that calls us to grace because we have been given grace. One that calls us to lift up the helpless, because we were helpless too. One that calls us to use the emotion produced by what we see to change what we see, ourselves and those around us for the better. One that calls us to stop complaining and start doing. All of this we can do because it was done for us first.